With one month to go, finalists of the BT Young Scientist & Technology Exhibition (BTYSTE) are busily preparing their projects for the 55th annual Exhibition. Taking place at the RDS, Dublin from 9-12 January, the brightest minds from across the island will gather under one roof to compete for the coveted title of BT Young Scientist & Technologist(s) of the Year 2019. This year, 1,137 students will exhibit 550 projects across four categories: Biological & Ecological Sciences; Chemical, Physical & Mathematical Sciences; Social & Behavioural Sciences; and Technology. The projects for the 55th BTYSTE very much reflect issues of ongoing global concern, with almost 100 qualified projects tackling climate change and environmental issues, doubling last year’s projects. Other projects touch upon topical issues from cervical cancer screening, the alternatives to and benefits of antibiotics; the growing impact of social media; with some even turning their attention to bee-related projects. For the 11th year running there are more girls than boys competing, indicating a positive trend in girls engaging in the critical subjects of science, technology and maths at secondary school level. There is also a 62% increase in the number of girls qualifying for Chemical, Physical & Mathematical Sciences on 2018, traditionally a strong, male dominated category. Overall, 237 schools from across Ireland are sending students to the exhibition in January. Over the past 55 years, the BT Young Scientist & Technology Exhibition has played an integral role in inspiring a love of science, technology, engineering and maths amongst younger generations, and is today an internationally renowned hub for future Irish talent. The BTYSTE has been the starting stage for some of Ireland’s most successful entrepreneurs and academics with notable BTYSTE alumni including: Steven Collins (1986-7), co-founder of Havok and Swrve; Patrick Collison (2005) the co-founder of Stripe; Kate & Annie Madden (2016) the founders of Fenu Health; and Forbes 30 under 30 and founder of Evervault, Shane Curran (2017), to name but a few. 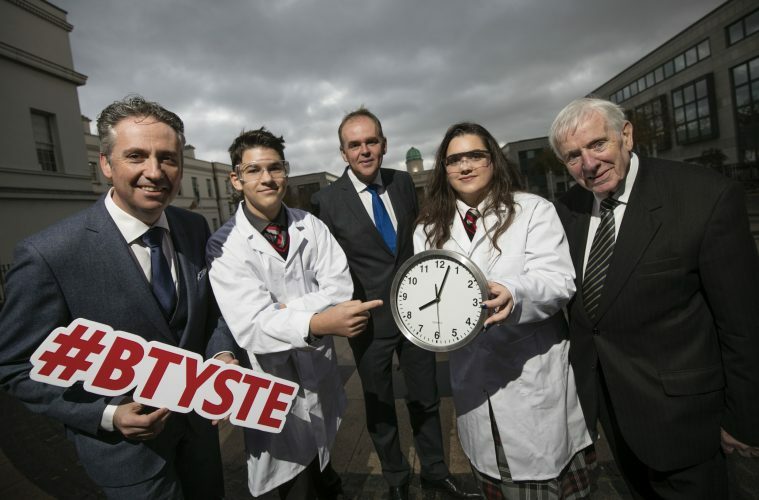 Minister for Education and Skills, Joe McHugh TD said, “I am heartened and encouraged by the number of students and schools that put forward such innovative and pioneering projects for the BT Young Scientist & Technology Exhibition. “The project title trends always show you what is important to young people in Ireland and this year it is no different with extremely topical themes such as climate change and the environment to the fore. That is why events such as this are so important as they allow students across Ireland to channel their talents and interests into projects and subjects which hold significant importance to them. Shay Walsh, MD of BT Ireland said, “The excitement is really building now in schools across the country as the students put the final preparations to their projects. And similarly back in BT we are beginning the mammoth task of building the Exhibition and finalising all of the logistics that goes with organising an event of this scale. The BT Young Scientist & Technology Exhibition will take place from 9 – 12 January 2019 at the RDS in Dublin. The exhibition offers one of the most sought-after awards for participants, with a substantial prize fund and the BTYSTE perpetual trophy, as well as over 140 prizes for individuals, groups, and teachers. In addition, the overall winner will represent Ireland on the global stage at the European Union Contest for Young Scientists in Bulgaria in September 2019. For more information on the exhibition and to purchase tickets log onto www.btyoungscientist.com or follow BTYSTE on Facebook, Instagram, Twitter, YouTube or Snapchat (username: BTYSTE).